What could be more relaxing than unwinding after a busy day at the office in a strikingly beautiful handcrafted copper bathtub? 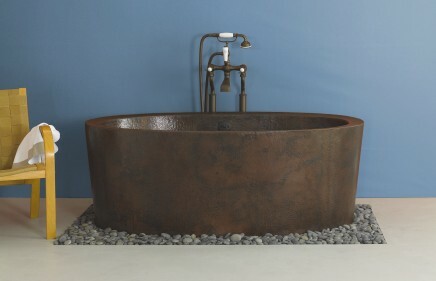 This luxurious copper bathtub by Native Trails makes an elegant focal point for any bathroom design handcrafted by skilled artisans from recycled copper. You can rest easy knowing that your bathtub is crafted in an environmentally responsible manner, using both ancient hand crafting techniques and post-consumer materials. The coppersmiths who create your Native Trails bathtub are highly skilled artisans who use tried and true blacksmithing techniques to produce each unique piece. The Native Trails artisans collect cast off copper from construction sites, old copper pipes, no longer used copper wiring, and other items that might end up sitting in landfills for decades. craftspeople transform these materials into elegant bathtubs and other elegant fixtures. The quality of their workmanship is evident in each finished piece. Each hammer mark on the finished bathtub represents the countless hours of labor and attention to detail that goes into crafting each piece using a hammer and anvil. You can opt to use a copper tub in your bathroom as a single metallic design element, or you can develop a coordinated suite with the full range of handcrafted copper fixtures provided by Native Trails. Additional available fixtures include various styles of handcrafted mirrors, sinks, and vanities. You may view Native Trails bathtubs and fixtures at over 1100 showrooms throughout North America. See www.nativetrails.net for additional information and product images.